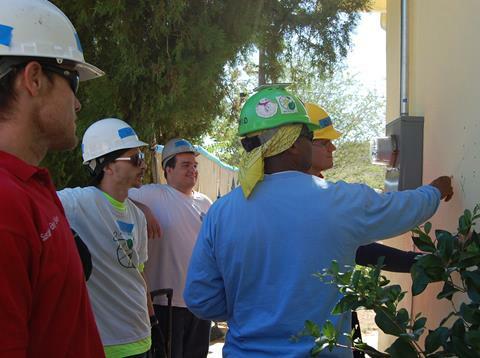 University of Antelope Valley’s Sustainable Energy students partnered with Grid Alternatives for a two-day project installing a photovoltaic system at a Palmdale home. The new system will help Marsha Furman (right) save on her monthly utility bills. PALMDALE – Several students were hard at work Wednesday helping retired grandmother Marsha Furman go solar. 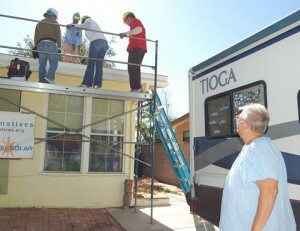 “This is a wonderful program,” Furman exclaimed, as she watched the students working on the roof of her Palmdale home. “This is absolutely free, and they maintain everything for 25 years,” Furman added. Grid Alternatives, a non-profit organization that brings solar technology to disadvantaged communities, has partnered with The University of Antelope Valley’s Sustainable Energy students to install a photovoltaic system at Furman’s home. Robert Heath, a student with just two weeks left to an Associate’s Degree in Sustainable Energy Technology, said the project offers real world experience in an exciting and growing field. UAV’s Sustainable Energy Course students attended an orientation on Tuesday, courtesy of Grid Alternatives, to qualify the students to be volunteers for the project. Lead Solar Program Instructor Uriah Ojan. 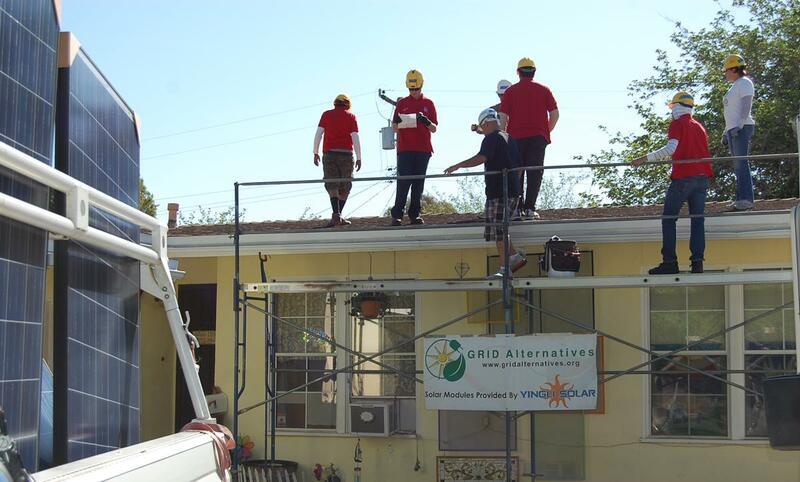 The two-day project includes nine students from UAV’s Sustainable Energy Program, the class instructor, and a solar installation supervisor from Grid Alternatives. For Furman, the project couldn’t have come at a better time. 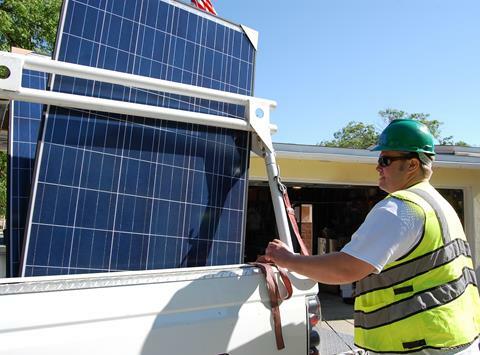 Grid Alternatives oversees the $108 million dollar Single-family Affordable Solar Homes (SASH) program, which provides significant rebates on solar electric systems to qualifying single-family homeowners and assists in paying for the energy upgrades. Their community involvement goes much further than just helping struggling families save on their monthly electric bills though. They also help the environment with every installation and give workers the hands on experience they will need in the Sustainable Energy industry. Depending on your income level, you may be eligible for an entirely free solar electric system, or a highly subsidized one. For more information on GRID Alternatives and eligibility requirements for the SASH program, visit http://www.gridalternatives.org/. For more information on UAV’s Sustainable Energy Technology program, visit http://www.uav.edu. 6 comments for "Solar students gain real-world experience helping local families"
Solar power is here, forget and ditch the plans for the polluting power plant in Palmdale. I am happy to learn about this great career choice for young people as it will help them acquire the jobs of the future. Thanks for this vital information. Yes let’s get rid of all non solar power plants and fossil fuels. Then we won’t have to read nonsense online because we’ll have no electricity for computers. By by Streets of Lancaster. By by Fair. By by Celebrate America. By by In the AV. By by BooLVD Halloween. By by BLVD Christmas. at least you won’t get Valley Fever from rooftop solar. It don’t tear up the desert either. Solar is the way to go now. UAV has a great Solar Program. Visit the campus and find out. The wave of the future here today. Great job UAV!